House of Lords reform, I said this was potentially the ‘big one’ in terms of constitutional change and political controversy. But my observation that ‘it is far from certain that sufficient political consensus will be created to make its enactment an inevitability’ proved accurate – it fell at the first fence and now seems firmly in the long grass. 1. The Children and Families Bill designed to amend the law on adoption and bring into law changes to the Family Justice system recommended by the Norgrove report, did not complete its Parliamentary passage and has been carried over into the 2013-2014 session. 2.The draft Local Audit Bill, which was designed to abolish the Audit Commission, got a pretty hostile reception from the ad hoc Parliamentary Committee that undertook a pre-legislative scrutiny of the draft. See http://www.publications.parliament.uk/pa/cm201213/cmselect/cmdraftlocaudit/696/69602.htm. However, the Government made it clear that it would proceed with the bill. See https://www.gov.uk/government/uploads/system/uploads/attachment_data/file/192495/29073_Cm_8566_v0_4.pdf. A Local Audit and Accountability Bill has been announced in the Queen’s Speech 2013 to take this proposal forward. 1. Most important for the English Legal System, the Crime and Courts Act 2013 gives statutory authority for the creation of the National Crime Agency. It provides for the creation of a single family court, which will change the infrastructure currently in place. It also amends some of the current provisions relating to the making of judicial appointments and provides for the televising of some court proceedings. 2. The Enterprise and Regulatory Reform Act 2013 implements proposals which seek to ensure that more employment disputes are resolved by conciliation. It also abolishes the Competition Commission and Office for Fair Trading and replaces them with a Competition and Markets Authority. 3. The Electoral Registration and Administration Act 2013 aims to make it easier for people to register to vote. 4.The Groceries Adjudicator Act 2013 formally creates the new scheme for adjudicating disputes between consumers and the ‘big name retailers’ – another area of disputes taken from the courts. 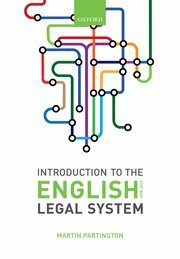 (There are over 60 industry adjudication schemes already in existence in the UK – many of them not well understood but doing work of resolving disputes that otherwise might have gone to courts). Although the Act did not receive Royal Assent until April 2013, Christine Tacon was appointed to the post in January 2013. It is perhaps a consequence of Coalition Government that the passage of legislation is not as predictable as when a single political party is in Government. Even so, most of the key measures, apart from House of Lords Reform, have made progress. It should of course be noted that major policy changes – effected by legislation passed in previous years – came into effect. These include: the reform of legal aid; fundamental change to the health service; changes to social welfare and benefits.